Provides high availability and disaster recovery capabilities for Linux, Linux on zSeries and AIX clusters. Provides automated operations and monitoring capabilities for increasing availability and ease operations of heterogeneous business applications. IBM Tivoli System Automation for Multiplatforms utilizes an adapter infrastructure to integrate with IBM Tivoli System Automation for z/OS, allowing for a more effective high-availability, automation, and management of multi-tier applications. 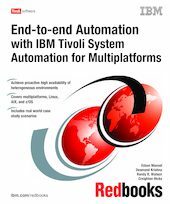 This IBM Redbooks publication introduces the new versions of the IBM Tivoli Systems Automation product family and gives a broad understanding of the new architecture and components of both IBM Tivoli System Automation for Multiplatforms V2.1 and IBM Tivoli System Automation for z/OS V3.1 using a scenario based approach. This book is a valuable addition to the existing products documentation and should be read in conjunction with the official products documentation, which complements some of the concepts explained in this book. The instructions given in this book are very detailed and explicit. These instructions are not the only way to install the products and related prerequisites. They are meant to be followed by anyone to successfully install, configure, and set up end-to-end automation management using IBM Tivoli System Automation for Multiplatforms V2.1 and IBM Tivoli System Automation for z/OS V3.1 in environments of any size.